This recipe is for people who prefer classic pecan pie to pumpkin pie, or enjoy a slice of each on Thanksgiving. It's unabashedly sweet — some might say cloying — which I is why I prefer the lesser amount of sugar. 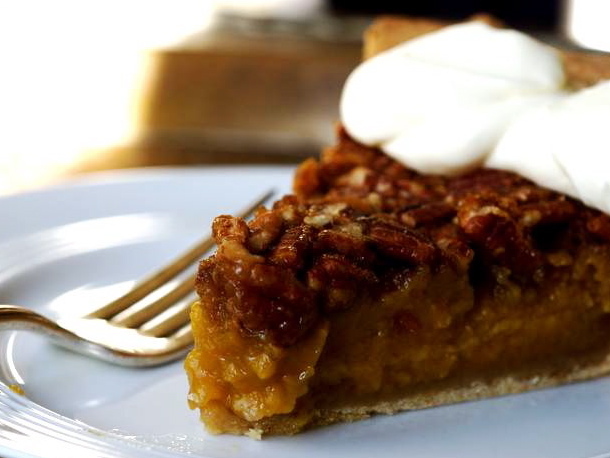 The pumpkin does add a nice earthiness to the pie. In a medium bowl, beat the eggs. Add the pumpkin, sugar, corn syrup, vanilla, cinnamon, and salt, and blend well. Pour mixture into the pie shell, and sprinkle pecans over the top. Bake for 55 minutes and then test for doneness every 5 minutes — first by visually checking that the filling is set (doesn't jiggle in the center) and then, when it's set, by inserting a thin knife into the pie; the knife should come out clean when the pie is done. Cool the pie, then chill it; serve pie slices with dollops of whipped cream. Read more about Thanksgiving menu planning in "Classic Thanksgiving."